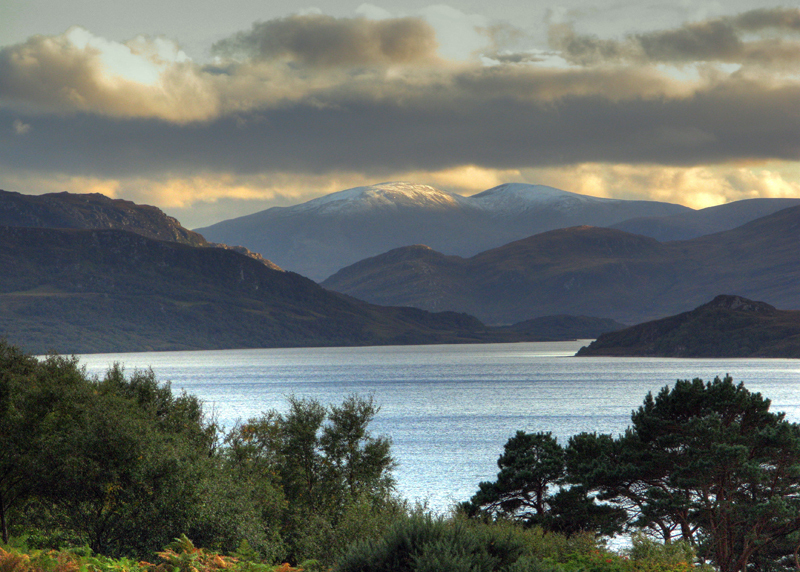 Loch Hope is one of Scotland’s last great sea trout lochs and fishers of the loch can still enjoy great fishing for sea trout and salmon. Boats can be taken at the North End, Middle Bay or South End, on a daily or weekly basis. Please email or telephone to book your fishing. The costs of taking a single boat and outboard are outlined below. Hope is a big loch, nearly 6 miles long, and there is productive fishing over much of its length either by dapping or wet fly. The loch starts to fish in late June and the fishing can be excellent right through to the seasons end at the end of September. It averages upwards of 500 sea trout per season, as well as useful numbers of salmon and grilse. The loch is divided into 3 sections North End, Middle Bay and South End to ensure that fishers have plenty of space. Boats are available to lease on all three. 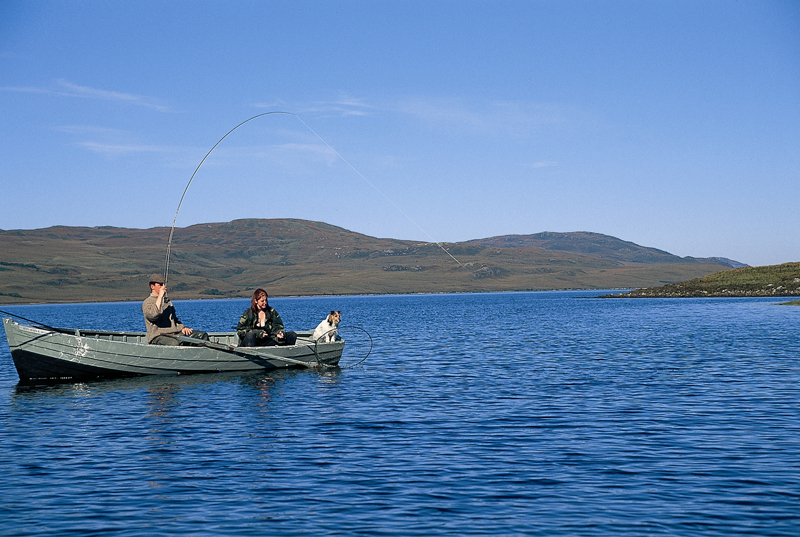 Loch Hope is primarily fished using two methods, traditional wet fly and the dap. Wet fly fishers will generally use a 9 to 11 ft single handed rod for 5-7 line teamed with a floating line and a team of three flies. Casts should be made in a fan shape around the drifting boat to ensure maximum water coverage. Distance casting is counter productive and a medium length line allowing half a dozen pulls prior to a lift and dibble as the flies approach the boat is the best policy. Fly choice is largely personal but every loch fisher’s box should hold a selection of sizes from 8-14 and include the likes of the clan chief, bibio, zulu (both black and blue), silver invicta, butcher, teal blue and silver, goats toe, dark mackerel and a muddler or two. Modern fishers prepared to experiment with intermediate and sinking lines teamed with more modern patterns will certainly meet with success. One of the great joys of Hope, however, is the success that a traditional and relaxed approach brings and it would always be our first line of attack. Dapping is something of a forgotten art but on its day it will outfish all other methods by a wide margin. We would recommend a telescopic rod, which can be bought cheaply, together with spool of dapping floss. Fly choice is not critical but a well hackled daddy longlegs will take some beating. The fly is not cast but ‘dapped’ on the water by the breeze. It will bring sea trout to the surface in all conditions and the action can be frenetic. A traditional approach would see one angler fishing the wet fly and the other the dap. Dapping is also an excellent method by which to introduce beginners to the sport as casting is not required and it can be very productive, albeit a little frustrating on occasion! The Ben Loyal is a bright and comfortable hotel with 11 rooms, surrounded by some of the most dramatic scenery in Scotland, including a view of Ben Hope on the horizon – and a well-deserved reputation for its sea-food menu. The hotel has a boat at the South End, and is only about 15 minutes’ drive from the North End. Borgie Lodge Hotel, Skerray, Tongue, KW14 7TH. Tel: 01641 521332. The Hotel lies in a secluded glen on the banks of the River Borgie. Famous the wild beauty of its location, it’s furnished “traditionally” with antlers, Clan Sutherland tartan carpets, sporting prints and log fires. The hotel has access to a Middle Bay boat, as well as fishing on other local waters. Hope North End is about 25 minutes’ drive away. The Craggan is on the western shore of the Kyle of Tongue, where the view of Ben Loyal – “Queen of Scottish Mountains” – is at its best. This is the local pub, where you’ll find a warm welcome, and a warm fire in the lounge. Rooms and meals are reasonably priced, and the North End is only about 15 minutes’ drive away. Tongue Hotel was a former sporting lodge of the Duke of Sutherland. Many original features have been retained: cast-iron fireplaces in bedrooms, tongue and groove panelling in bathrooms, marble topped washstands and brass bedsteads. Bedroom are all decorated differently and are light and comfortable. Most have views over the Kyle of Tongue to the mountains beyond. The North End is about 15 minutes away by car.